A beautiful antique iron door knock - no key. A very nice decorative piece. PAIR CAST IRON GOTHIC CHURCH DOOR FAUX HINGE. CHEQUES TO BE CLEARED BEFORE DISPATCH. A beautiful antique oak and iron decorative door knock - no key. Depth approx: 1 5/8". 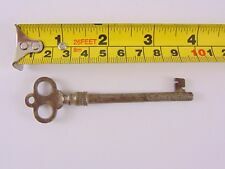 Antique Large Key 8¼" (21cm) - 17th Century?. - My Ref.K205. 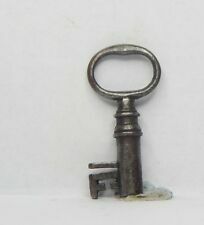 Antique Large Key 8¼" (21cm). An interesting key which clearly shows how the key was made. 17th/18th Century. It's very hard to date examples like these, however 17th/18th century seems likely. Original antique rim lock. Large size measuring: Length: 23cm,Width: 15cm, Depth: 3.5cm. See photos for close up details. Please take a look at my other auctions as I’m listing more antique and vintage items every day and I’m happy to combine postage on multiple purchases. I have no key or keep, the key had broken in the lock and the bits I extracted are there. It hasn't got an escutcheon so I will send one which I haven't attached as don't have the right screws. The inside is free moving so I think it will work with a new key. SCARCE 16TH CENTURY LARGE WROUGHT IRON PADLOCK & KEY. Possibly French or German?. Great size Lock with hand made key, in full working order. Antique rim lock wooden cover. Lovely decorative piece in original layers of paint. Large size measuring: Length: 20cm, Width: 13cm, Depth: 3cm See photos for close up details. Please take a look at my other auctions as I’m listing more antique and vintage items every day and I’m happy to combine postage on multiple purchases. The lock is mounted within it's original oak block (which is very nearly black with age). They key is a Gothic kidney bow style with claws. If we state an item to be from an era (ie "Victorian"), this will be a researched decision and we will be certain that we are correct. A fantastic opportunity to own a stunning antique wood and iron rim lock with brass detailing. centre of the keyhole is 10.5cm (4 1/4") from the edge of the deadlock side. The back of the lock is signed "ADAM - MARR (?). 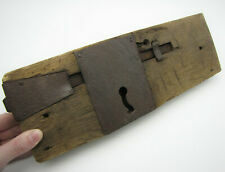 A beautiful antique oak and iron door knock with working key. Marks/wear from age/use. Length approx. (not including when locked bolt): 12 3/8". Size of key approx. : 6 5/8". A beautiful large antique iron door lock with working key. If the key is turned once, the bolt moves outwards into the locking position, and if turned again it moves out further. There is also a lever on the bottom which slides a bolt into place. Antique Iron Dungeon Padlock. This functional locking dungeon padlock is sized for small places. this is the perfect lock for securing prison leg shackles. Length: 12 cm. As you can see they need a good clean and paint. All estimates are for the United Kingdom. We try to recycle where ever possible. A beautiful antique oak and iron door knock - no key. A very nice decorative piece. Length approx: 13". Needs work cleaning oiling etc. as you can has scratches etc. I have for sale this great antique iron key. Condition is used, surface marks/rustic etc from age and use. This is a nice large example. I have for sale this great antique iron key. Condition is used, surface marks/rustic etc from age and use. There is old paint over the key. This is a nice large example. Victorian or earlier rim lock removed from the front door of my parents vicarage built circa 1890. Lock housing and keep made from wood and trimmed with metal. Believed to be original paint finish? Comes with matching key escutcheon and fixing screws to match lock housing. Sadly comes without key. due to size, fragility and value I would rather not post this item. You may of course arrange your own service totally at your own risk/liability. Cash on collection preferred please. Any questions, please ask. Thanks for looking. 13 Cm x 11 cm 6.5 cm depth In working order no key made of cast iron . Great collectors piece. Antique Church Door Lock. Completely Renovated.3 1/2" Backset. 8" x 5 1/2"
Fully reconditioned antique church lock. In good working order. Ideal for the collector. Original antique rim lock wooden casing. Large size measuring: Length: 24cm, Width: 14.5cm, Depth: 3.8cm See photos for close up details. Please take a look at my other auctions as I’m listing more antique and vintage items every day and I’m happy to combine postage on multiple purchases. 4 huge cast iron keys on ring jailor castle church dungeon chapel country manor house. As a key collector, I have seen various sets of keys on rings, as we all have. These all appear quite different therefrom and from each other. Antique Old Cast Iron Large Heavy Door/Gate/Castle/Church Key 4 1/2"
14 Large Skeleton Keys Lot Antique Vtg Old Look Ornate Victorian Gothic ! 14pcs Skeleton Keys Lot Pendant Fancy Heart silver white look Ornate. Suitable for any DIY craft,eg; your bracelet,necklace,anklets,A good choice for Treasure Hunting,prepare one for a babyshower party,house moving,Pomotion ceremony,graduation ceremony. Antique Locks Beads 85gr - 40-50 units - latch latches - Necklace Vintage Charm. Antique Locks Beads 85gr - 40-50 units - latch latches. Antique LOCKS Beads. Specially selected Antique locks beads sourced among 30 different models suitable for steampunk, scrapbooking, arts, crafts and jewelery making project. Old Gothic. Rim Door Lock. Large Church. Oak backed Wooden Housing Box. No key Included. Height: 13.5cm.